For more information, visit www.pedagogyoftheoppressed.com. 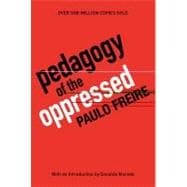 The justification for a pedagogy of the oppressed; the contradiction between the oppressors and the oppressed, and how it is overcome; oppression and the oppressors; oppression and the oppressed; liberation: not a gift, not a self-achievement, but a mutual process. The ``banking'' concept of education as an instrument of oppression---its presuppositions---a critique; the problem-posing concept of education as an instrument for liberation---its presuppositions; the ``banking'' concept and the teacher-student contradiction; the problem-posing concept and the supersedence of the teacher-student contradiction; education: a mutual process, world-mediated; people as uncompleted beings, conscious of their incompletion, and their attempt to be more fully human. Dialogics---the essence of education as the practice of freedom; dialogics and dialogue; dialogue and the search for program content; the human-world relationship, ``generative themes,'' and the program content of education as the practice of freedom; the investigation of ``generative themes'' and its methodology; the awakening of critical consciousness through the investigation of ``generative themes''; the various stages of the investigation. Antidialogics and dialogics as matrices of opposing theories of cultural action: the former as an instrument of oppression and the latter as an instrument of liberation; the theory of antidialogical action and its characteristics: conquest, divide and rule, manipulation, and cultural invasion; the theory of dialogical action and its characteristics: cooperation, unity, organization, and cultural synthesis.